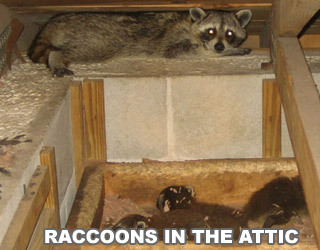 One of the most common scenarios that we deal with is wild animals in the attic of a home or building. You can hear them running around and scratching and chewing up there. If you look in your attic, you may find footprints and feces. If you hear the noises at night, it's a nocturnal animal, like a rat or a raccoon. If you hear the noises in the daytime, it's probably squirrels. If the noises sound heavier, it's likely a larger animal. 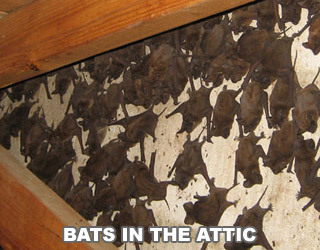 Whatever it is, we will inspect the attic, and we will know exactly what type of animal you have. We will inspect the home and find out how it got into the house, and we will seal all entry points shut after we have trapped and removed the animals. 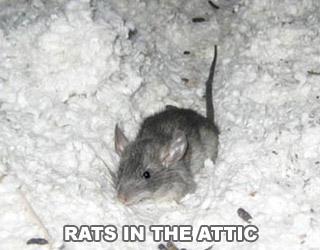 After the animals have all been removed and the damage repaired and the entry holes closed off, we will clean and decontaminate your attic, to eliminate the odor and biohazard that the critters in the attic have left behind. 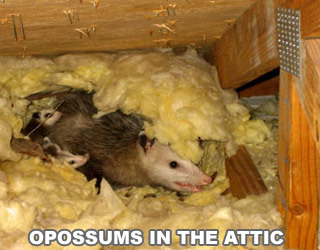 How can critters get in your attic - Nuisance animals, especially squirrels, rats, and raccoons, will have no trouble getting in your attic if you have not kept up with your home repair. The top portion of a home is often the most neglected because it is out of reach and out of mind. This innocent neglect can result in damaged eaves, damaged chimneys, broken attic vents, and even disrupted windows. It only takes a small hole for a squirrel to find its way into your attic. You’ll know the location by the dark staining around the hole. This is where the animal’s body rubs, and it will eventually leave a smudge mark from the oils on the skin. Some holes are not as obvious, like the ones in a damaged vent; however, you should assume that a damaged vent is where the squirrel is getting inside if there are no other holes around to be seen. Rats should be trapped, not poisoned. Squirrels are not animals to be caught with snap traps, and the best methods for eliminating a squirrel from your home are installing a one way door or repeater trap. Both of these methods are effective for squirrels. Unlike rats, the squirrel is not desperate to live inside of the home. The only potential complication will be if baby squirrels are in the attic. Before you can eliminate the mother squirrel, the babies have to be removed or allowed to mature to the point where they can leave the attic as well. The same goes for raccoons.